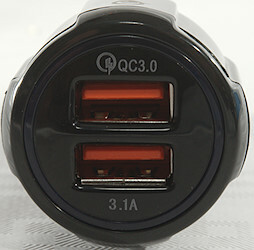 It looks like the charger has QC3 output and a 3.1A output. 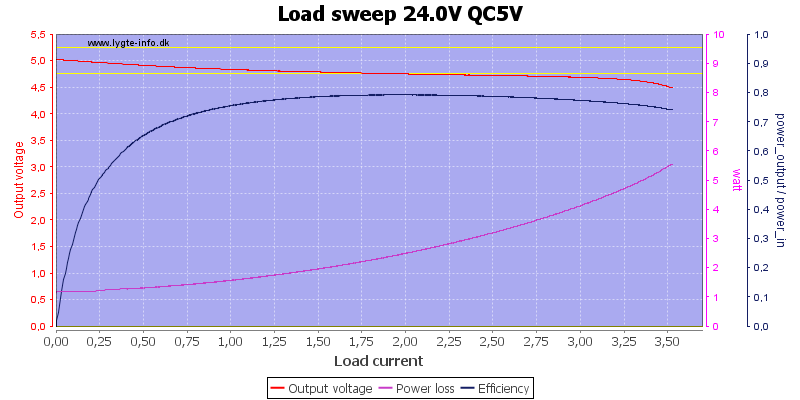 Specifications are a bit funny, the QC output is missing a 5V specification. 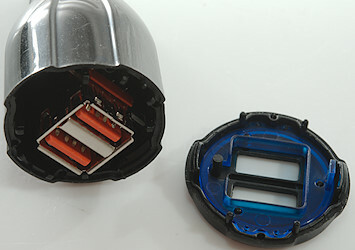 After my testing the back of the charger looked a bit different, my guess is the spring overheated due to input current. There is weak blue led inside that lights inside the USB connectors and a ring around them. This outptu is rated 3.1A, but cannot deliver more than 3A. 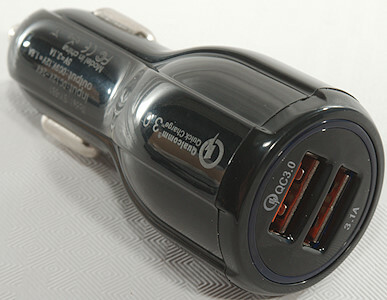 For a regular USB this is more than enough. 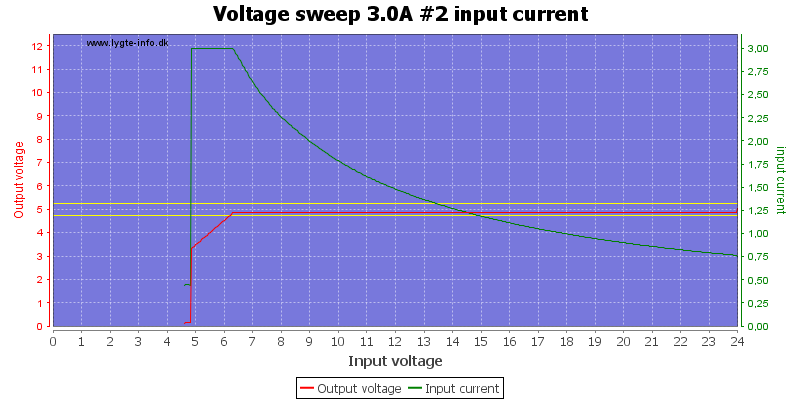 Output current drops a bit when voltage increase. 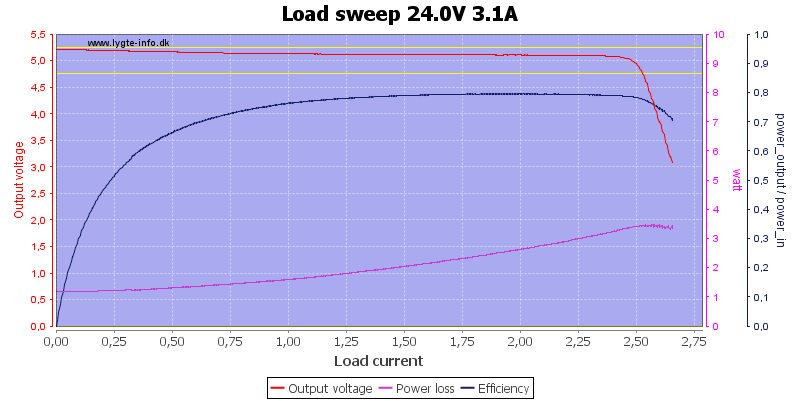 And even more at 24V, here the current is down to about 2.5A, very sensible value for a high power regular USB output. 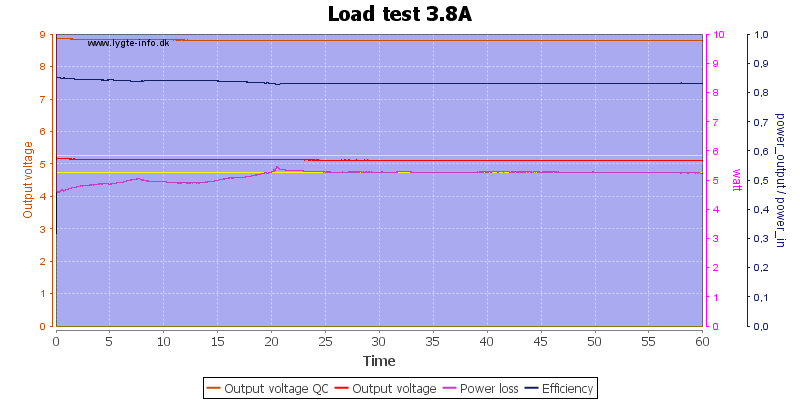 The QC output is a bit low on protection, I stopped my test at 4A. 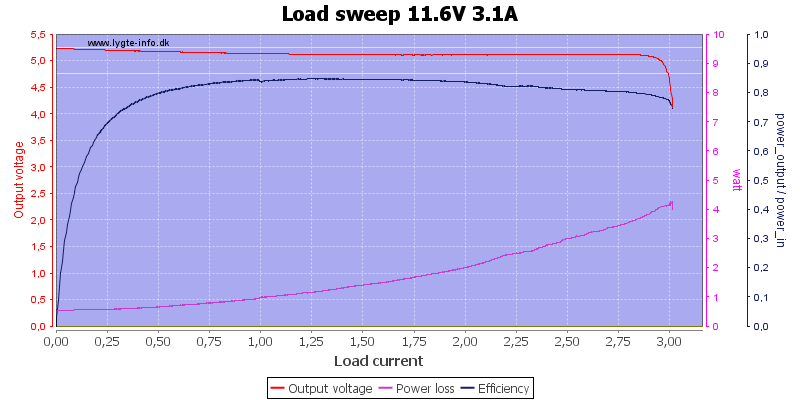 Notice that the power loss inside the charger is 6 watt, this is a lot. Increasing the input voltage do not change much. 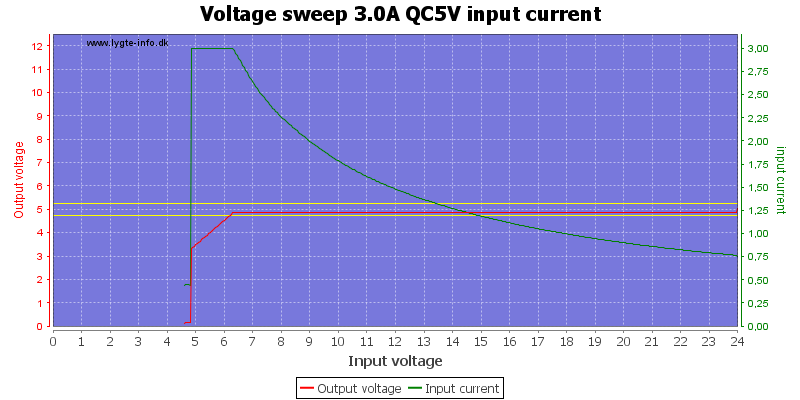 At 9V the output current is also close to 4A (3.8A). 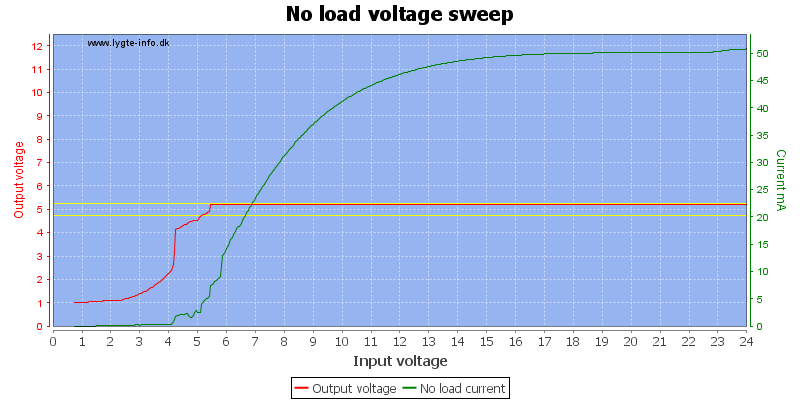 With low input voltage and 12V output the circuit does strange things and the power loss really gets high. 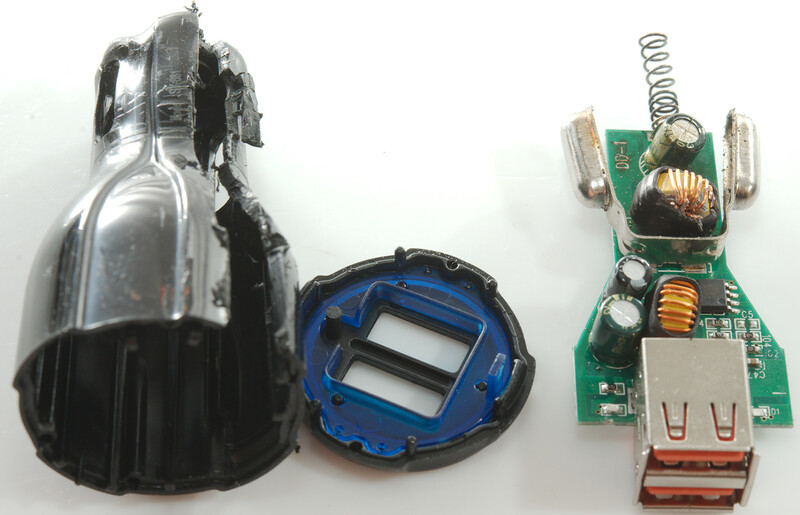 It was probably here the back of the charger melted. 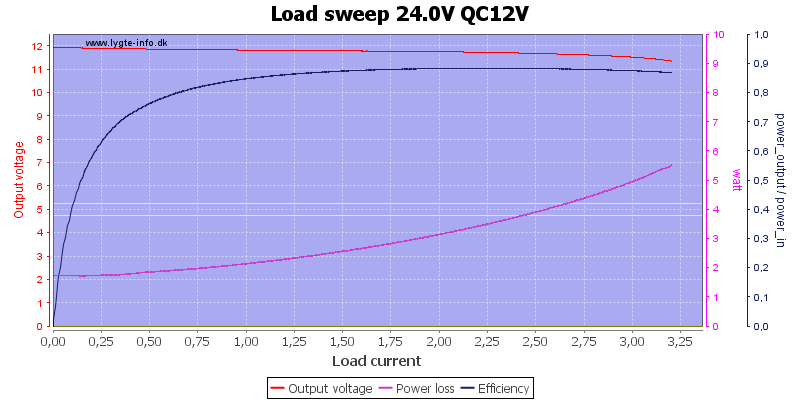 With 24V input the QC 12V output can deliver more than 3A. 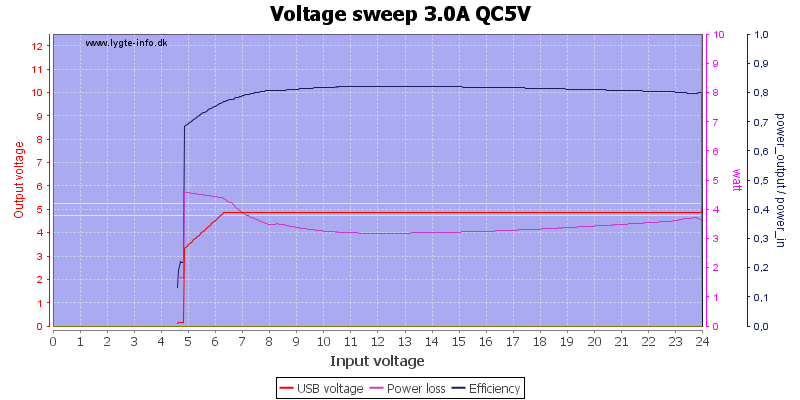 The regular USB output can maintain 5V output with down to 6.5V input voltage from the car. QC is about the same. 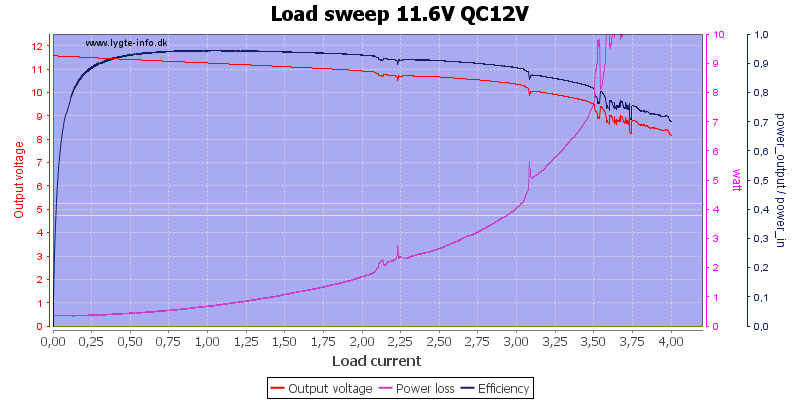 The 12V QC requires about 13.5V input to be at full voltage. 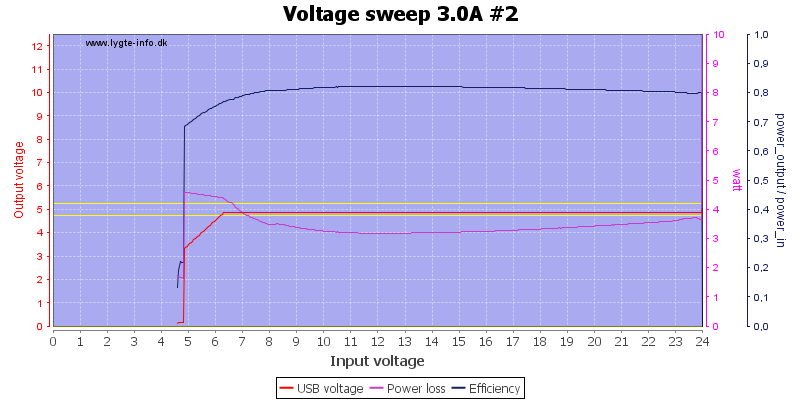 The no-load current consumption is fairly high on this USB charger. 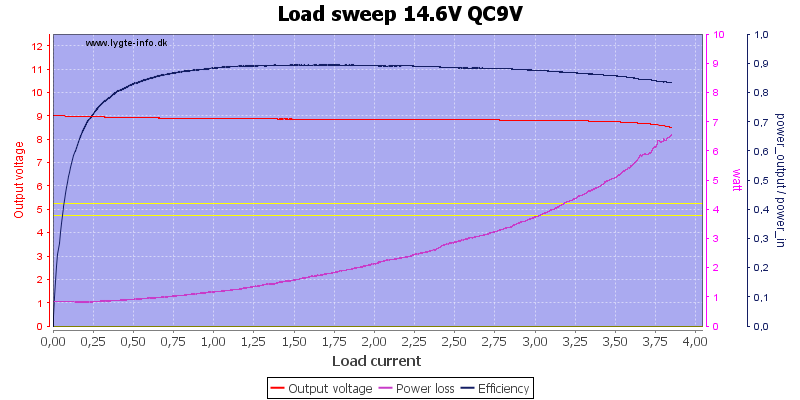 Without any real good specifications I decided to use 2A load regular USB and 1.8A load on QC9V. 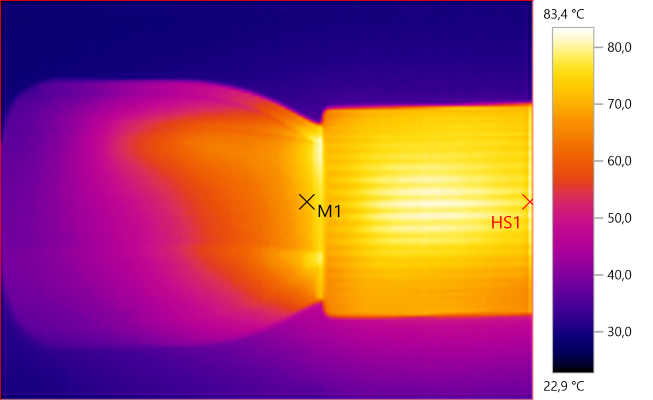 The back of the charger was melted before I did this test. 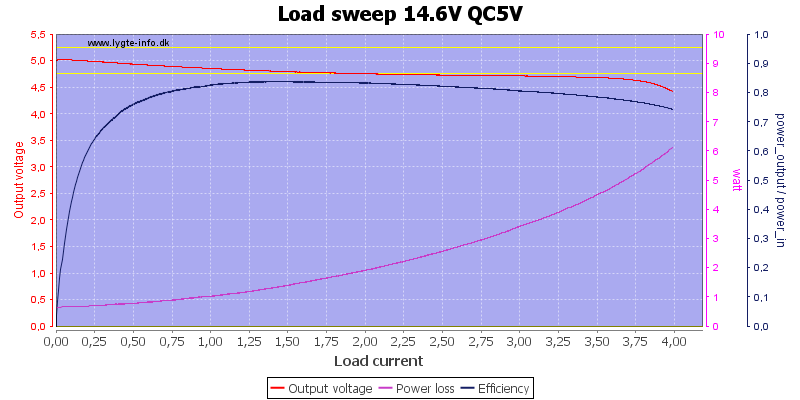 Noise at 1.2A output is 5mV rms and 55mVpp. The front was fairly easy to pull of, but the circuit board would not come out, probably due to the melted back. 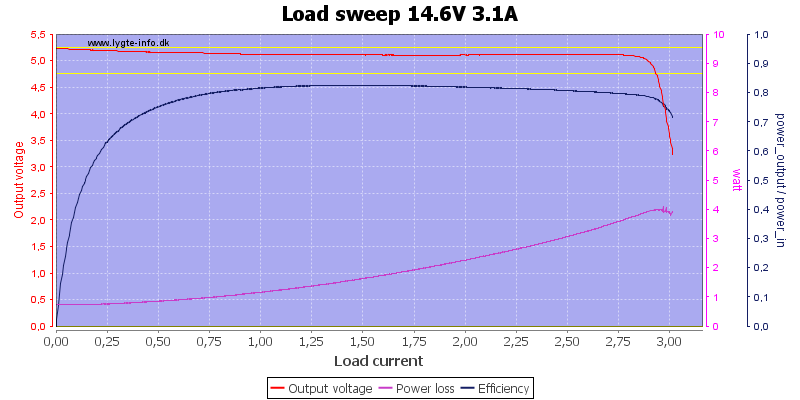 Some cutting later I could get it out, but I damaged on of the inductors. At the back is the spring that looks like it has been very hot. 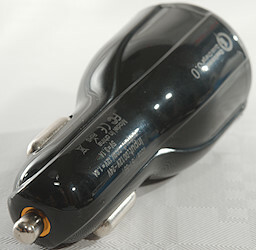 Then is the 5V USB output switcher (Lintop LT8002C). 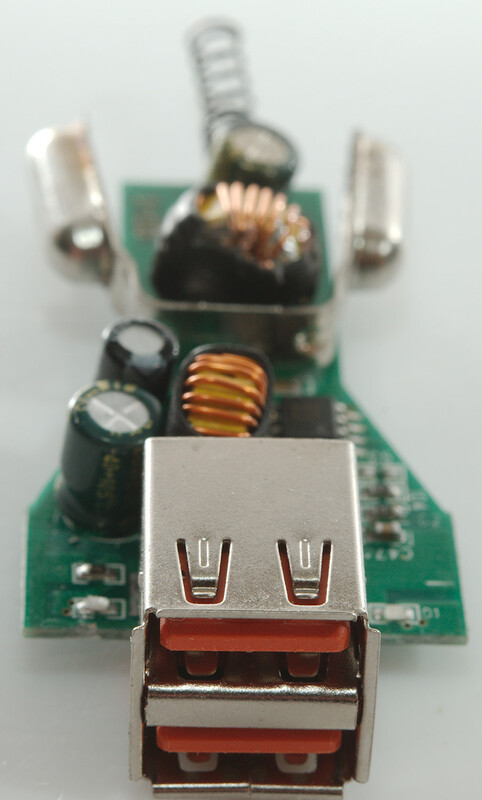 Closer to the USB output is the QC3 switcher (Lintop LT6005C) with a QC3 controller (Marked O1Q9B). 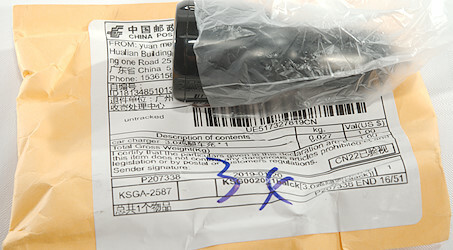 At the front is two blue leds. 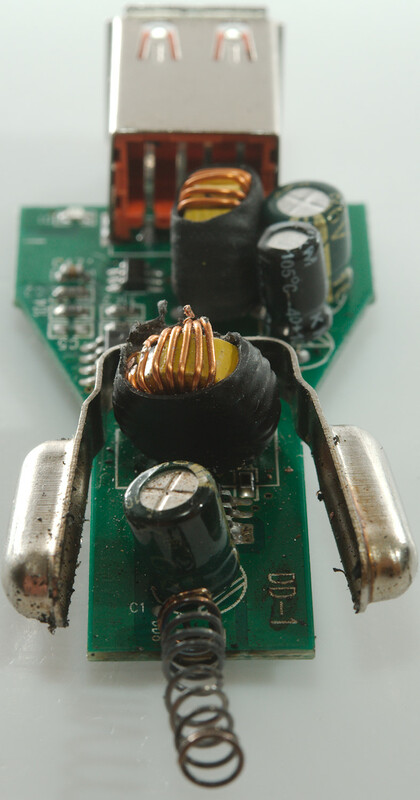 There is nothing on this side, bit the have been a bit sparse with soldering. 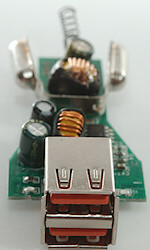 The USB connector and the minus connections are both missing a solder connection. 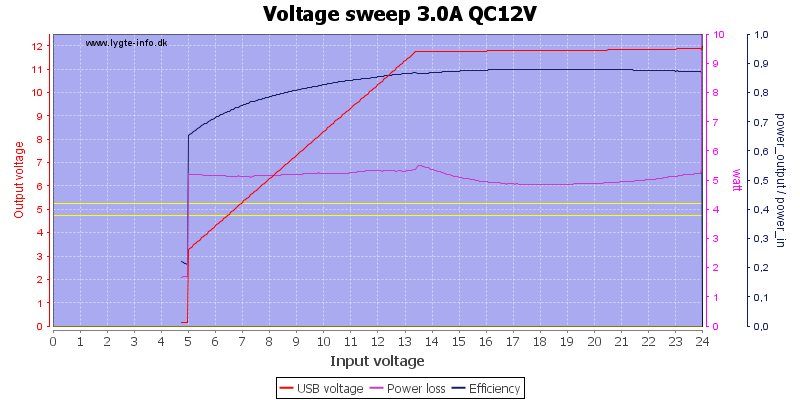 The charge can deliver a lot of current on both regular USB output and QC3 output and also way to much. 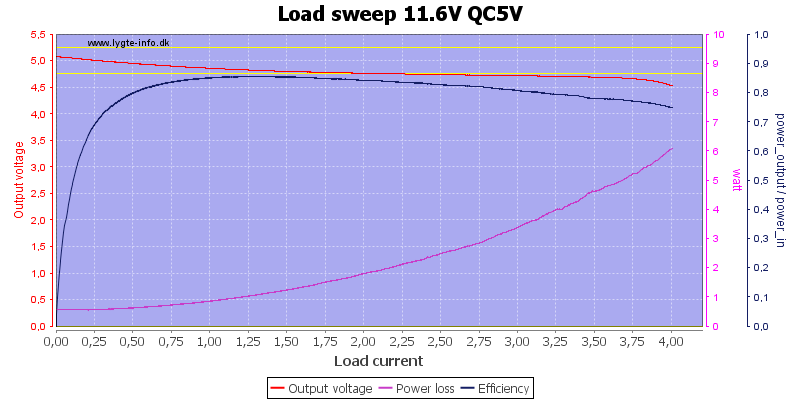 I would have liked a auto coding chip for the regular USB output to better use the power. 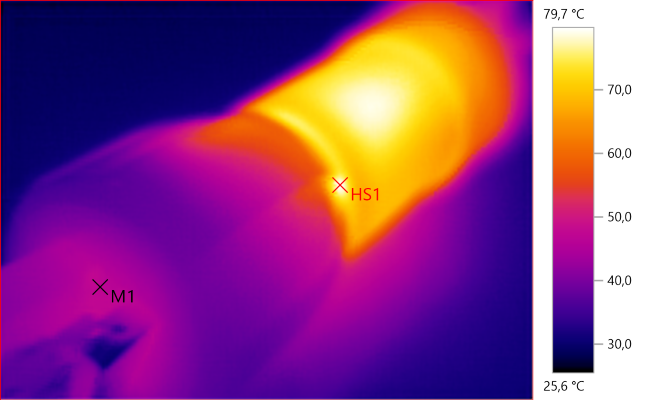 There is no real overload protection and the device will melt when overloaded. 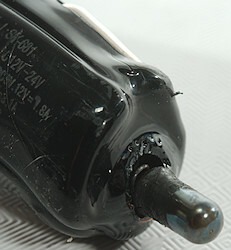 As a charge it works fine, but there is some serious issues with safety.